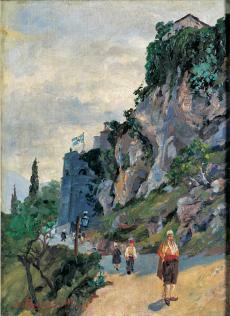 He studied at the School of Arts in Athens (1888-1892) and the Munich Academy. In 1909 he returned to Greece. He participated in the BalkanWars, recording in his paintings scenes from the front, as well as landscapes and views of nature. From 1919 to 1922 he lived in Thessaloniki,where he copied mosaics and frescoes in the Church of Agios Dimitrios. He also made copies after historical paintings by Peter von Hess.His landscapes form part of the plein air tendencies in Greek art of the early 20th century.